Alena Zavarzina describes IOC decision as ‘political games’. 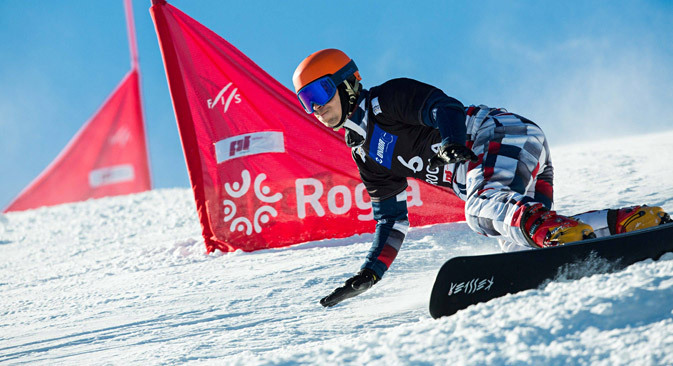 Russian Sports Minister Vitaly Mutko has described as "wrong" the decision of the International Olympic Committee (IOC) to exclude the snowboard parallel slalom event from the program of the Olympic Games. The decision was adopted at a session of the organization in Lausanne on June 8. The IOC also included four new events in the program of the Olympic Winter Games in 2018 – snowboard big air, speed skating mass start, the Alpine skiing nations team event and mixed doubles in curling. "We had scarcely developed the parallel event, when they introduced a new kind ["Big air" is an acrobatic type of snowboarding, popular primarily in North America – RBTH], which has only two competitions and is being developed in only two countries in Europe. I am absolutely convinced that this is wrong," Mutko told the R-Sport news agency. American-born snowboarder Vic Wild, who won a gold medal in parallel slalom for Russia at the Olympics in Sochi in 2014, said he wanted an explanation from the Russian Olympic officials who allowed the exclusion of parallel slalom. "I'm not surprised, since the United States Ski and Snowboard Association (USSA) has a great influence on the United States Olympic Committee (USOC), which in turn is a powerful force in the IOC. I'm worried about where the Russian Olympic Committee was at this time," Wild was quoted by R-Sport as saying. Wild's wife, Russian snowboarder Alena Zavarzina, also questioned the fairness of the IOC's decision, describing it as "political games" in comments to the Gazeta.ru online newspaper. Denis Tikhomirov, head coach of the Russian team and president of the Snowboard Federation, said that Russia was involved in the fight for the preservation of parallel slalom, along with Europe, but it was being opposed by U.S. representatives because the country has no team in the event. "The International Ski Federation has already written a letter to the IOC with the request not to exclude parallel slalom," Tikhomirov was quoted by the TASS news agency as saying. "We teamed up with Europe to preserve this event in the Olympic program. However, another continent had a different opinion, which was heeded by the IOC," said Tikhomirov. As a result of the changes in the list of Olympic events, 100 sets of medals will now be up for grabs for the first time in the history of the Winter Olympics. The changes "will allow for a record number of female events, a record number of mixed events, a record number of female athletes, and a projected increase in the overall female participation rates at the Olympic Winter Games," the IOC said in a statement on its website.